Showing results for tags 'amati'. Hello MSW! After perusing build logs for the past week, I have finally sat down to work on my own kit. A little back story for me. My great uncle recently passed and had spent many years building ships. When last I visited him in Chicago, he had at least 5 ships on display. I had spent the majority of my family's visit there talking about modeling and found my interest in the hobby. Before we left, he had given me a box to kickstart my toolbox. For my birthday that same year, my mother bought me the Amati Drakkar kit to encourage me to pursue it. Well, after almost a year of sitting in my closet out of fear for lack of space and time, I have no opened up that kit and got to work. I appreciate the advice a lot of you have given me and the build logs that are available. I have learned a lot and hope to apply at least some of that knowledge to this kit and all going forward. To start things off, I read through the parts list and skimmed the entirety of the instructions. Then I cut out of the keel and frames, dry fitted to see how much adjustment would need to be made during gluing, and got to gluing. I ended up having to shimmy the smaller frames on the bow and stern because I didn't realize the clamps had held them at an angle. They were square horizontally with the keel, but not vertically. Luckily I caught it before the glue set too much and I could get them off without any damage. I re-glued them and made sure they were held straight and let them sit. Has any one threaded the sails on for this kit? According to the diagram in the instructions, it looks as though they are threaded on the ends. I started my Lady Nelson in 2012 but I’m a little bit slow. Build Kit logs are really inspiring for me, so after reading lot of topics I decided to post my build log. Hello all, ..... recently signed up, and the first post from me, so I guess this constitutes an introduction, as well as my first post, come build log. So then - Andi Little, and little Andi by nature. long time modeller but a first proper attempt at a wooden model. I've been a fan of small open boats since childhood, dinghies dories tenders jolly boats pinnaces etc - et al. I've been trying to find out ways of building open boats for years, and generally amusing myself just solving the problems mentally. But for some reason, it seems to have loomed larger in my mind and I've finally chosen to tackle it as a project. I saw someone else's ongoing build of the Whaleboat and was really quite smitten with the whole look of the thing - I liked its lines the details and accessories ... and perhaps more to the point it looked do-able? .................... Don't tell me if I've made a mistake in that assumption as I've read up on the admins' advice on keeping things simple-ish to start off with and had hoped this would do the trick. Eventually, the ambition is to be able to build from scratch an array of small handsome rowboats and sailboats - I love these things. I lived aboard for many years and often watched them buzzing around - I am to this day still in love with "Emily from Morston" and an unnamed Estuary boat that I often sailed up and down the river Thurne. Well enough about me .................. for those may have not seen the project in question, and by way of commitment of intention .................... ..................................................... Cheers all ... Andi. There are several excellent build logs on the HMS Vanguard already, so why do another one was my first thought. I decided what the heck the world needs more build logs. For credibility purposes, I posted a few photos of my completed HMS Pegasus in the Gallery portion of MSW. Here’s why I am a bit reluctant: 1. Since completing the HMS Pegasus in 2010, the sixth of almost back to back models over 6 years, I had shoulder surgery (which in part I think had to do with long periods holding small pieces of wood) and I don’t want to go through that again. 2. 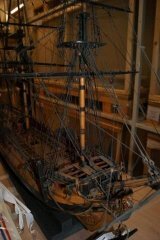 Back in 2010 I did very detailed build logs on my Lauck Shipyards Fair American and the Amati Victory Models HMS Pegasus for MSW, and they are lost forever. To be clear, I consider that my fault for not keeping an offline copy of the text, though I do have the photos. Frankly I wish I had those logs for myself here 3 years later to remind me of what I did and not have to learn those lessons again. 3. My primary interest these days is photography and traveling so I just don’t want to spend as much time modeling as I did for the first 6 models I built. I tend to obsess. Plus having finished my niece's wedding photos I still have a photo landscape book to prepare from my recent trip to Iceland. I was particularly focused on historical accuracy for the Pegasus, I bought the Antscherl/Herbert Swan and read other not as good books, obtained copies of original drawings of the Pegasus from the Admiralty, (great for framing and workroom wall art by the way), kit bashed like crazy, etc. For the Fair American I was meticulous and obsessing over every detail, wanting to obtain, in my own mind at least, master class status as a builder. Now, not so much of any of that matters. My goal is just going to be make the best of the Chris Watton designed kit, replace a some of the wood with quality stuff from Jeff Hayes at Hobbymill, and just go for “pretty.” Fair warning, it won’t be historically accurate, for starters I’m not going to paint it with the Nelson yellow and black colors. I want to use some nice woods on the upper hull, perhaps cherry, yellow heart, and ebony, I haven’t really decided yet. I know when I do I’ll be able to get high quality lumber from Hobbymill. Also, more than likely I will stub the masts for the simple reason it’s so big already and the location I have in mind for the finished work won’t support three feet of height (oh my gosh, substituting pretty and the table location for history, what is he thinking). I will endeavor however to make it right, nothing that detracts from the quality of the finished product. It will look like a 74 and have the name Vanguard on the back. I like to think of it as the Vanguard from some parallel universe. For many of you, the above paragraph was the last you read as you marked this log as “do not bother.” Nonetheless, I hope I can offer a few insights here and there that might help you in your own mission-oriented kits. So check it out from time to time if you like. If not, that’s ok too. I’ll have fun writing it anyway. I’ll try not repeat what others cover, but who knows. While I could I suppose, I'm not going to go for every extra level of detail, though I enjoy looking at those on the Pegasus with my magnifying glass... I may not be as good a builder those other guys, but I’m no rookie either. I hope to be casual about all this as well; I’m going to try and not obsess about stuff as I have in prior models (as much anyway). Hopefully I’ll give you something useful to apply to your modeling; otherwise I’m either wasting my time or just seeking positive reinforcement (which isn’t t bad, so feel free to offer it…frequently). So with that as the intro, and if you’re still with me, the next post will cover the initial steps. Also from by georgous partner got me this kit for my birthday.This will be the next build once I finally finish the Friesland. Another build log will be up for this little ship. A new build so I have something to do while waiting for Vasa parts. I ordered this from Maristella and apart from the excellent service Mr. Pavlovich offers I believe that they offer the best prices in Europe. My only regret is that I did not order one of Marisstellas own kits instead. But then again I have a reason saving up money for that in the future. The Xebec is the smallest shipmodel I have had so far. But the rigging is something that I for some reason wanted to try out. And it will be like a practice before I go on with my Pinco Genovese that is more like a semi scratch build from Euromodel Como. Here's the pics: Stuff: They updated the older kit from 1027 to 1427. There are 4 sheets of plans. 3 and 4 are of the updates. Instructions in Italian, but there is a paper included with the English translation. Bits and pieces: More: Ships boat: Wood, Looks like good quality. And we're underway!!! Captain's Log, star date 06 February 2017. So, we are off. The 101st build of the cutter, "Lady Nelson". The kit has now arrived from those wonderful people down in Camelford, along with the tools I thought I would need. I am now happy in the knowledge that I have done my bit to keep the Italian economy afloat. I should say at the outset that this will be a "basic" build, with little variation from the kit, unless you guys advise me otherwise. Reading through the logs of other first time builders, many of them seem very modest about their skills and experience, and all credit to them for that. I have to state that I am an absolute beginner. At present I don't even know which saw to use for which job (No cutting comments please). I will not be revealing reconditioned tools that I have rescued from a decommissioned nuclear submarine. So, my apologies in advance for what I am sure will seem like very naïve questions. However, I am very much reassured by the quality of the Amati kit, now I have it. It looks amazing. This is my work area a.k.a. "The broom cupboard". The admiral has commandeered the rest of the house. One tool I did buy was a set of Model Shipways "Hull Planking Clamps". Does anyone here use these? http://www.cornwallmodelboats.co.uk/acatalog/model-shipways-planking-clamps-MX104.html These come flat packed, just like a ship kit. They are advertised as working with bulkheads of 3/16" or thicker. Inevitably, when Lady Nelson arrived, her bulkheads were only 3mm thick, which is nearly 2mm too slim. So, I immediately had to modify these clamps by adding some cuttings from the sprue that surrounds the wooden clamp parts to the inside of the clamp jaws, in order to narrow the gap. I also found that, on trying to tighten a clamp with its wing nut, the bolt just rotated. A spot of superglue inside the bolt head of each clamp helps to keep it in place. Incidentally, I was pleasantly surprised at how easy the various adhesives were to work with. There is hope for me yet.